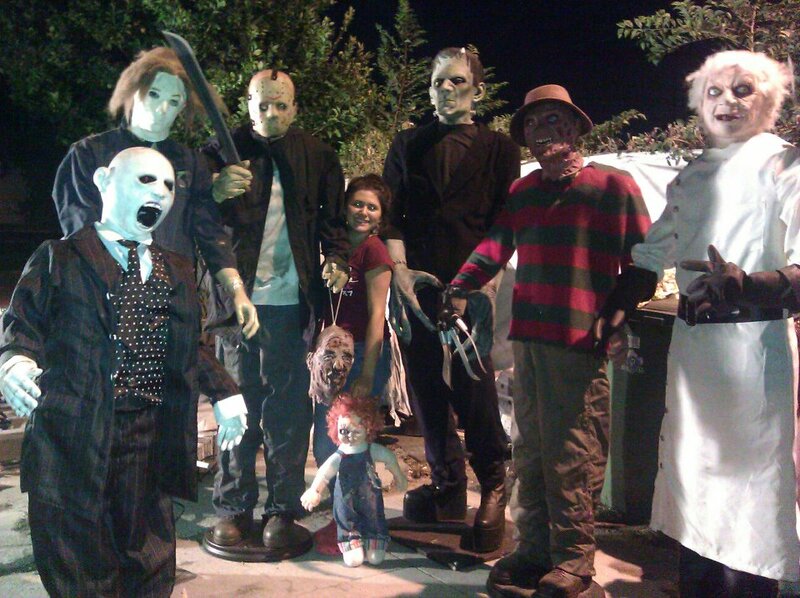 The Western House of Darkness is a long-running amateur Halloween yard haunt that features scary decorations with a few animatronics, music and sound effects. Decorations are usually on display by mid-October. On Halloween Night, the owners throw a neighborhood potluck party, offer treats for the local kids, and dress in costume to deliver a scare or two. This way to the graveyard, but watch out for the giant inflatable kitty, wit moving head. The Western House of Darkness sits quietly tucked between local businesses – its decor a strange anomaly amid a hair salon and a fishing tackle store. A witch-like figure dangles from the local bait-and-tackle store. An intimidating vampire bat rests in front of the yard, waiting for nightfall. Does this guy ever get tired of screaming? Note the Frankenstein Monster in the background. Left to Right: Michael Myers, Jason Vorhees, Nosferatu (or Graf Orlock, if you prefer), and Regan Teresa MacNeil, with a clown and a skeleton in back. Oh, no! Demented Babies haunt the front yard, too! More strange beings lurking in the yard, including a two-headed girl.